Only 10 days after issuing a much debated limit on the visa on arrival, this limit has now already been cancelled (see below for the Indonesian document and the English translation). The original document (20 October 2015) was an internal memo with a list of instructions designed to catch illegal foreign workers. These instructions were created by the local Bali Immigration department and were meant for the local Bali airport immigration officers. The purpose of these instructions was to increase the surveillance on foreigners who were suspected of working illegally on a tourist visa (either 30 day free visa or 30 day visa on arrival). One of the instructions made (but now cancelled) was that a visitor was only allowed to enter Indonesia maximum twice per 12 months on a tourist visa (either a visa on arrival or free visa). The same Immigration office, who first issued this new decree with limitations on the number of visa on arrival entries (among others), has now cancelled this decree only 10 days later. Continue here to read the current Indonesia visa regulations. Here is the translation of the letter that now cancels these limitations. 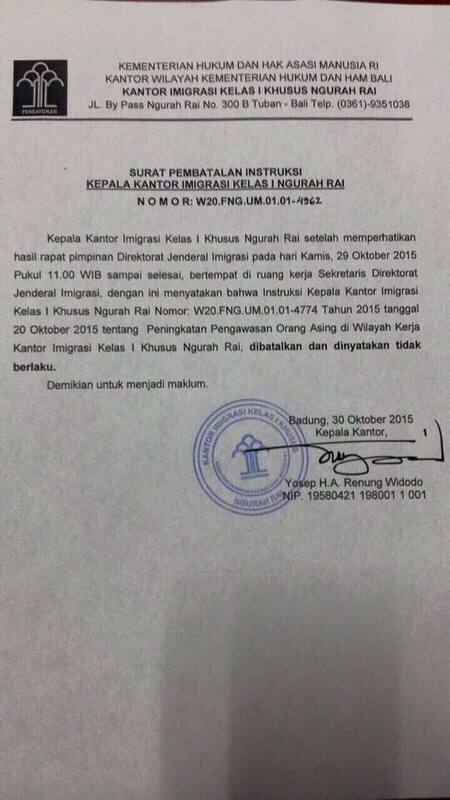 The head of the Ngurah Rai immigration department has decided after the meeting on Thursday, 29 October 2015 at 11:00h WIB (12 noon Bali time), at the secretary’s office of the Immigration, about the instruction of the Ngurah Rai department with number; W20.FNG.UM.01.01-4774 year 2015 on 20 October 2015 about the increased surveillance of foreigners in the working area of the Ngurah Rai immigration office, canceled and declared null and void. Copy of Indonesian language document. I have an important question, I would be grateful if you can answer me clearly. Maybe consider applying for a social visa. I am Pakistani national and working here in Qatar in Govt Department. Few months back I hear in a news that Indonesian govt include Pakistani citizen to travel as a tourist on a arrival visa. I just want to confirm that can I travel as a tourist and get on arrival visa or I should apply for visa here an Indonesia embassy. Pakistan did not make it to the final list of 169 free countries. If you are from Pakistan then you need to get a visa before traveling to Indonesia. You should be Ok as there is no law that limits the amount of visa on arrivals you can do per year and as long as you don’t use your visa for the wrong purpose. Ketut , sorry I’m not understand in clearly. Please explain me in clearly..
Hello, if you have a Kenya passport then you can get a free 30 day visa. You can find the current Indonesia visa regulations over here. Hello! I have one important question. I’m a Portuguese citizen, and I will arrive to Bali one day at evening, and I go Dili on next-day morning (so I will stay one night in a hotel in Bali). I need some kind of visa ? Can you help me. Thanks in advanced. Hi Nuno, as you are from Portugal you will get a free 30 day visa. You can read the current Indonesia visa regulations over here. Thank you for your answer. I forgot to mention that after some days in Dili I will back to Bali (and stay more 6/7 days to visit more things)before I return to Portugal. I had read the regulation but I have a doubt because I don’t know when it’s consider be in tourism or be in transit. Thanks in advanced. Hi Nuno you will be fine. The regulation was cancelled and even if it was still active it was aimed at catching illegal foreign workers. There is no need to worry if you are here on a day transit and then a 7 day holiday. Enjoy! Hello Marco, as far as I am aware there have been no changes to the social or business visa. … it means it is like before? 30 days no problem? Hi Manfred, yes, there are no longer limits on how often you can visit Indonesia. The standard tourist visa is 30 days (either an extendable 30 day visa on arrival or a non-extendable 30 day free visa). Thanks for information! Are you from the government or what are you doing? Hello! I have one very important question. Could U please help me and say how many times I, as a polish citizen, can enter indonesia, ( especially Bali ) during 12 months on VOA with my brazilian husband. I will really appreciate your help cause I found few different infos and I am lost…a bit. We are going to bali with no illegally work intension. We are both freelancers and work only with our computers and we want to move there to practice yoga , work in co-working places on our online business and blogs and have a great time, but we know already that 60 days is not enough. So please give us any info how it really looks like there with this thing. Thank U very much and have a great day ? What they were trying to do with these regulations is to try and limit foreigners working illegally in Bali on a tourist visa. They were not trying to limit legitimate tourists although it sure did look like it. Asians, they are different. Thats it. No logic to be used.